Eureka! Entertainment have announced the home video release of Computer Chess, the smash indie-hit selected by the 2013 London Film Festival, 2013 Sundance Festival, 2013 South by Southwest, and 2013 Berlin Film Festival. A boldly intelligent ensemble comedy with a feel and atmosphere that surpass easy comparison, Computer Chess takes place in the early-1980s over the course of a weekend conference where a group of obsessive software programmers have convened to pit their latest refinements in machine-chess and the still-developing field of artificial intelligence (AI) against an assembly of human chess masters. Computer Chess is a portrait not only of the crazy and surreal relationships that come to pass between the abundance of characters who participate in the weekend event (and among whose ranks include Wiley Wiggins, the revered indie-game developer and star of Richard Linklater's classic Dazed and Confused), but of the very era of early computing itself – and of the first, rudimentary video games – and (if that weren't enough) of the hopes and insecurities that persisted through the film's "retro" digital age into the present-day – that semi-virtual, hyper-social, maybe-kind-of-dehumanised landscape that, let's face it, is our very own era. If that still weren't enough: it's also one of the wittiest, most shift-and-cringe-in-your-seat, and entirely LOL-hilarious movies of recent times. 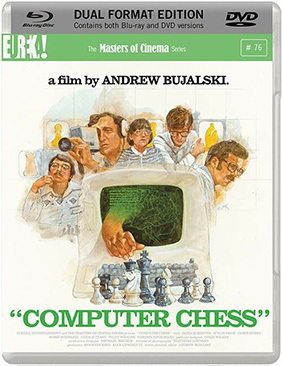 Computer Chess will be released on UK dual format on 20 January 2013 by Eureka! Entertainment as part of the Masters of Cinema series at the RRP of £17.99. 56-page full-colour booklet featuring a new essay by Craig Keller; a discussion on retro gaming with Wiley Wiggins; a profile on cover artist (and original Atari 2600 packaging artist) Cliff Spohn; a plethora of full-colour photography from the set; and more!